With the kids back in school, now is a good time to get back into some decorative craft projects. The first place to start is with your Fall decor. 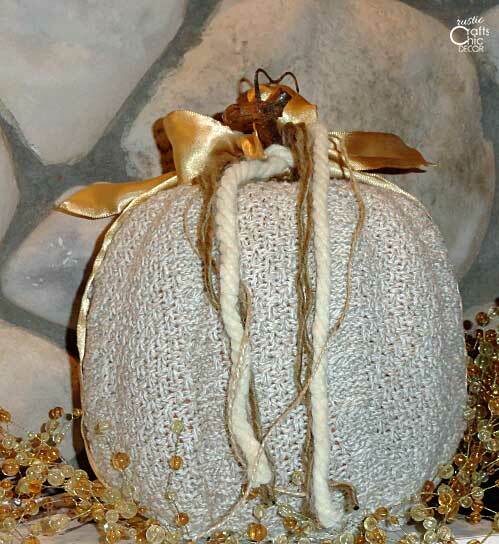 However, instead of spending a lot of money in seasonal decorating, I am going to show you how you can incorporate recycled materials into your projects for a much more budget and eco friendly option. 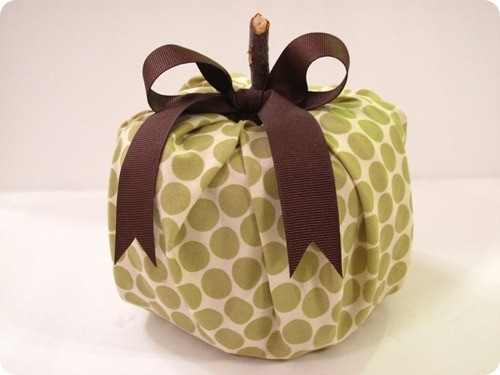 All of the Fall craft ideas, that I have found, use at least one item that has been recycled. Last year, I made this sweater pumpkin out of one of my husband’s old and worn sweaters which gave a warm neutral look to a common Fall item. Plus, I didn’t have to throw out a sweater that was stretched out and too worn for charity. 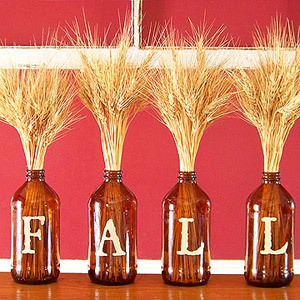 Here is the list of other Fall craft ideas that you can try. 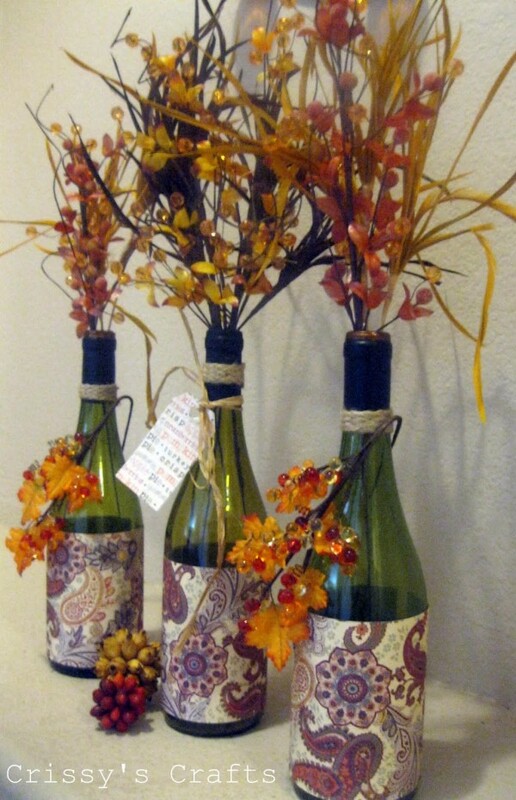 Re-use those wine bottles for beautiful vases for your Fall table. Decorative paper and rope add a little extra embellishment to the vase filled with silk flowers. These glass jars make a nice arrangement with the white letters mod podged on. The brown coloring is perfect for Fall. Tin cans and mason jars can be transformed into stunning candle holders with just a little embellishing! 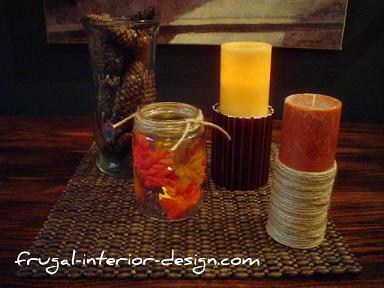 Gluing reeds or jute string to a can makes a perfect base for a pillar candle and a few colorful leaves inside a glass jar is all that is needed for some great Fall color. 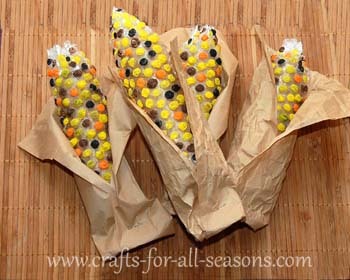 This is such a cute idea for Indian corn using bubble wrap and an empty paper towel tube. This toilet paper roll pumpkin idea is such a cute idea for some quick and easy Fall decor to coordinate with any room in your house.